Thank you for everything. I don’t believe but finally, this day has come. 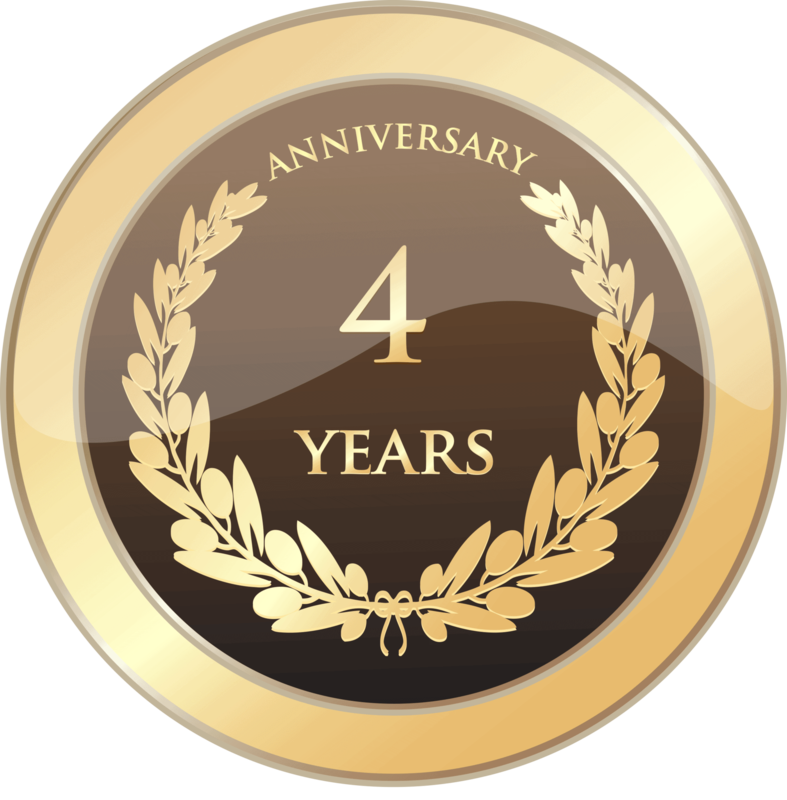 I have completed 4 years of this journey of blogging. I know that my blogging ratio is not great; still, I am satisfied today. I had published my first blog post on 24th September 2012 to share the most unforgettable memory of the 2 days back in 2011. I had posted my first blog post on 22nd Sept 2012 on Tumblr. Using Tumblr from a feature phone was a big task for me. And then I saw an advertisement of mobile supportable blogging website Mywapblog.com in UC Browser on my feature phone Nokia 2700 Classic. To gave a try I registered on MyWapBlog.com in the fine evening on 24th September 2012. I just copied my own blog post published on Tumblr 2 days back and published on this new platform. To my surprise, I felt MyWapBlog.com more comfortable than all other blogging platforms I had tried before. I decided to continue writing on this platform. Though MywapBlog.com is a mobile compatible blogging platform it was not all easy to use all features even on this platform for an amateur mobile user. But I learned to use all BBCodes and HTML tags properly and developed the whole website from my feature phones Nokia 2700 classic and Nokia X2-02. After buying a laptop Dell Inspiron 15-3537 (My Review) around 2.5 years back and a smartphonePanasonic P55 in the end of January 2015, it went very easy to use all features available on this platform. As you know, the journey of this blog was started with the memory of a special day from 2011. 2 days ago, it was the 5th anniversary of that wonderful meeting which I had shared in my 1st blogpost. I wished to celebrate the 5th anniversary of that day on last 22nd Sept. but I couldn’t publish a blog post due to very upset mind. I didn’t have any goal to publish that blog post but today this blog is known for my detailed Book Reviews! Oops! My BookLysis! I have launched a sample android app of this blog, parked my own domain rdhsir.com and published my 150th blog post in this year. In my 150th post, I had promised to share my ideas and future plans for this blog in the post on the 4th anniversary. I didn’t forget my promise. I wanted to share my future plans. I was profoundly enthusiastic about this very special blog post. This blog post was supposed to be published in the midnight. But… in this week, something sorrowful happened with me which should not happen even with an enemy. I will share the meticulous story of these bad incidents happened in this week someday. But today, let me give you the hint of those excruciating happenings. Due to lack of an antivirus program on my laptop, a Ransomware named CERBER3attacked my laptop and encrypted all my files containing important images, videos, songs, and documents saved in Local Disc D, E, and F drives. It may be a mere coincidence or my misfortune that I had asked my Dad to buy an antivirus program on the very same day when I noticed those files in unsupportable format. I was in no mood to check computer that evening, but my Dad checked the computer to view images saved into D drive of the laptop. First I saw unsupportable files with unfamiliar titles in an opened folder and deleted the folder without noticing the format of those files. I opened another folder and I was shocked to see the same random file names and .cerber3 format of those files. Only positive thing was the original size of those files was same. I became anxious and checked some more folders and I was almost frightened to see each and every file saved in the supportable/accessible format of images, videos, songs, and documents were renamed by 10 random symbols and format of all files in all drives were converted into.cerber3. I understood that my laptop was attacked by some virus. I was alarmed and petrified to lose my important data. I shared the problem with some friends. InstalledNet Protector Pro antivirus in the same night updated that program and scanned full PC, NP Pro antivirus detected 44 viruses and 7 malwares and cleaned 50 infected files out of 51. But nothing worked. I shared my problem seeking for some help. 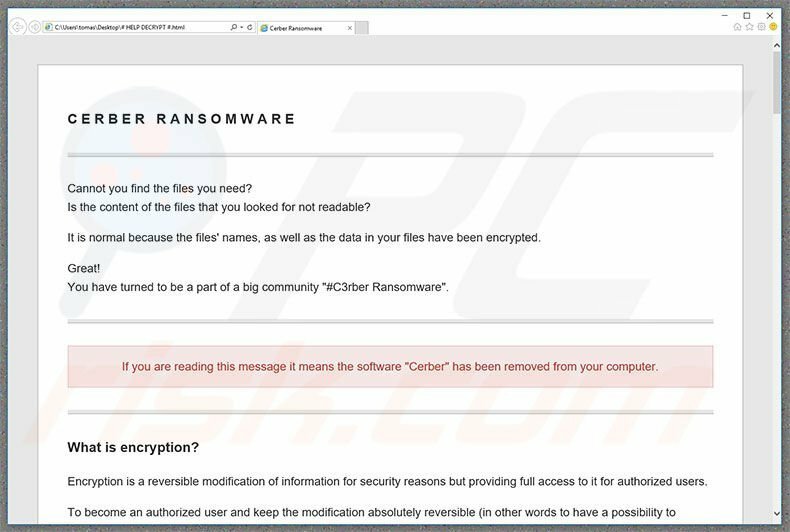 I researched about CERBER3 on Google and got to know that CERBER3 is a ransomware which makes 3 @__ReadMe__@ files in 3 different formats (.html, .txt and .url) in each attacked folder and the ransomware encrypts all your files’ type as CERBER3 with .cerber3 format/extension and rename your files in 10 random symbols. This ransomware asks you to purchase a private key from one of 5 links mentioned in @__README__@ files in exchange for payment in Bitcoins. I checked alternate method and found a guide to remove cerber3 ransomware, decrypt folders and recover files but I failed. I showed my PC to local computer hardware repairing center but failed. I tried to scan this virus with Quick Heal antivirus but failed. I formatted Local Disc C drive and re-installed all programs includingWindows7 operating system from Computer Workshop Gondia, scanned full PC again but nothing worked. I phoned 2 computer Hard Disc data recovery centers in Nagpur and got to know that there were only 20% chances of decrypting files and recover my data at costly charges. Finally, I was left with no other option than formatting all drives to save my laptop from this ransomware. Hence, I took a backup of saved files from this ransomware and formatted all drives on Thursday. I had so many pictures captured on various occasions and trips, a terrific collection of captivating videos, a collection of excellent songs and crucial documents. I collected all the data after so many efforts. It's excruciating to lose all the data. Unfortunately, I don’t have any other backup of formatted data and only exceptions are 16 GB Micro SD Card each of me and my younger brother Vivek. Fortunately, I have a backup of all documents (PDF) saved in my Micro SD Card and I still have photos of my Nashik’s second trip and a recent tour of Kota and Ajmer in my phone. Else, I have lost everything saved on my laptop.Now, I will have to try and collect all the data from friends and internet once again. I will write about this worse experience and perilous ransomware CERBER3 very soon. But before that let me thank my friend Rahul Girhepunje for helping me in every possible way to remove CERBER3 ransomware and at least a try to recover my encrypted data. I thank my friend Pramod Ukey for opening his shop Vighnaharta Computers to sell me a CD of an antivirus. I would thank SysGuru Computer’s Ramteke Ji for not asking me for money in return of his failed attempts to decrypt my data. I thank my friends Manoj Raut and Jitesh Pachole for accompanying me to travel to Gondia for consecutive 2 days in the despondent state of my mind. I would also like to thank author Vikrant Shukla Sir for understanding my anxiety and texting as well as communicating with me over the phone about this issue despite his swamped schedule. I had thought that what would I write in this blog post but now I realize that this post too has been extensive. Okay! 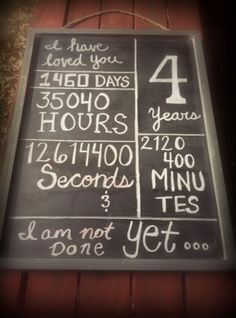 Sorry for one more long post; but, I won’t get an opportunity to write a blog post on THE FOURTH ANNIVERSARY OF MY BLOG. On this occasion, I heartily welcome my friend Ankit Kumar as a typesetter of this blog and Janci Rani as a proofreader of this blog. And now, let me share the stats of this blog in these 4 years. Finally, I thank everyone who visited my blog even for once. Thank you for every single time you have visited this blog and viewed a page. Thank you, everyone, for everything. Keep visiting! Your Support Gives Me Strength to Keep Writing..!!! P.S. : This blog post is not typed by Ankit and not proofread by Janci. Congratulations Rajesh. Keep it up..
Hearty wishes, sir. 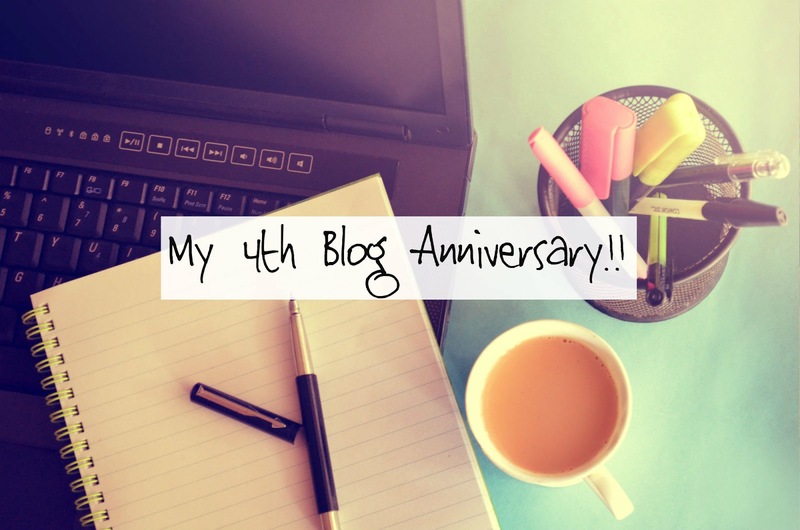 You have crossed a milestone of 4 years as a blogger. And it's not an easy job to attain it. My support will always be with you.